Health data constitutes a significant resource in most OECD countries that could be used to improve population health, the quality of health care and the performance of health systems. Rising levels of chronic diseases; concerns about the quality and safety of patient care; the need to assure value for investments in health care; and the need to allocate health resources wisely; are all too important to be left without good evidence for decision making.This book, based on studies of 19 countries on the development and use of personal health data and of 25 countries on development and use of electronic health record systems, includes results showing good practices, new opportunities and data privacy protection challenges. It finds that well-intended policies to allay concerns about breaches of confidentiality and potential misuse of personal health data may be limiting data use, but that the next five years appear promising, in terms of both the number of countries that plan to implement national electronic health record systems and the number that consider it likely that data from these systems will be used for some aspects of health care quality monitoring. They also appear promising for the further use of existing personal health databases and for the linkage of multiple data sources to generate new evidence. 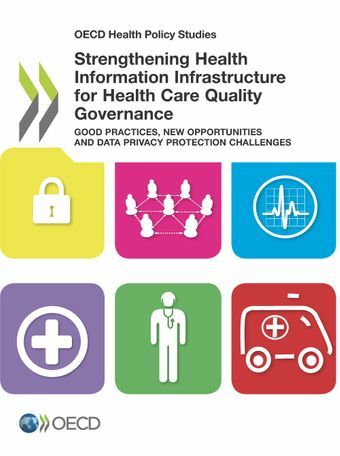 This OECD Health Policy Brief summarises the key findings of the OECD study Strengthening Health Information Infrastructure for Health Care Quality Governance: Good Practices, New Opportunities and Data Privacy Protection Challenges. Download the OECD Health Policy Brief. Health data constitutes a significant resource in most OECD countries that could be used to improve population health, the quality of health care and the performance of health systems. The 2010 Health Ministerial Meeting called for OECD support to strengthen national health information infrastructure to provide the evidence needed to improve health care quality and the performance of health systems. In 2011/12, twenty-five countries participated in an OECD study to understand the extent to which countries develop and analyse personal health data and the reasons why data use may be problematic in some. Sources of personal health data include registries, administrative databases, population surveys, patient surveys and clinical records. - Many countries are linking and analysing personal health data to report on the quality and cost-effectiveness of treatments; to address underuse, overuse and misuse of therapies; to reduce variation in care practices; to assess and revise clinical care guidelines; and to manage health expenditures. - Some countries expect that within the next five years data from electronic health record systems will also be used for health care quality monitoring. There are considerable and troubling differences across OECD countries, however, in the extent to which existing health data may be used for public benefit. These differences are related to risk management in the balancing of individual rights to privacy and collective rights to safe and effective health care and to a high-performing health system. Laws and policies enabling privacy-respectful data use are needed to strengthen national information infrastructure. To develop international studies comparing health care quality and health system performance, actions are needed to reduce unnecessary differences in data protection practices. When reforms are proposed, however, their impact on health and health care statistics and research must be given consideration. In so doing, there can be a conscious balancing of both privacy rights and rights to health and to safe and effective health care. A role for the OECD in the coming years is to continue to support countries in reaching the goal of strengthening health information infrastructure so that privacy-respectful uses of data for health, health care quality and health system performance monitoring and research become widespread, regular activities. This requires monitoring national progress and assisting countries in overcoming obstacles to privacy-respectful data use. - Joint Work with the OECD Science, Technology and Industry Division is continuing on benchmarking internationally the adoption and use of health information technologies through the development and testing of questionnaires. - A second survey of countries’ development and use of personal health data to track progress; and a new project to develop a risk classification of data and data uses that identifies cases of higher risk to patient’s information privacy and recommends data privacy protection practices are underway. - Article published in July 2013: Oderkirk J, et al. International comparisons of health system performance among OECD countries: Opportunities and data privacy protection challenges. Health Policy (2013).